Good morning from a snowy St. Joseph’s Indian School! The Lakota boys and girls are so delighted to be able to give a gift to their families! After a wonderful weekend, we awoke Monday morning to the white stuff coming down. Several schools in the area closed and St. Joseph’s 7th & 8th grade girls’ basketball game was canceled. Even today, roads are covered in ice. 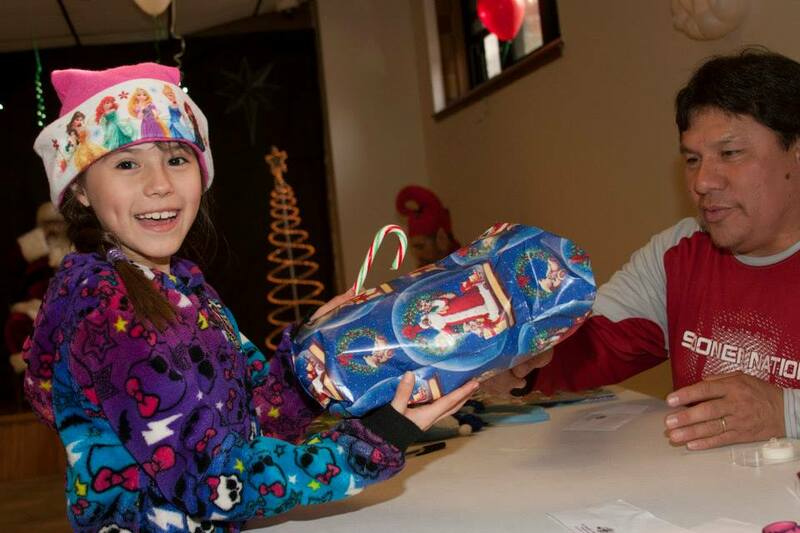 The big excitement over the weekend was the Christmas Store which gives our Lakota students the chance to select gifts for family members at home. Each student chose from a selection of things sent by generous donors – coloring books and crayons, stuffed animals, hats and scarves, blankets and even nick knacks. After making their choices, they took them to the skating room. 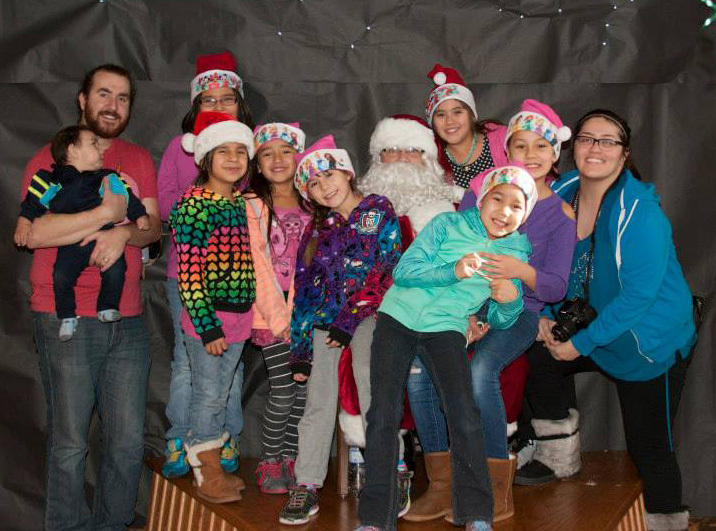 Volunteers were waiting to help wrap their treasures while they had a Christmas treat and a picture taken with Santa. The smiles on the children’s faces say it all – they are so happy to be able to give a gift. Thank you for making those smiles possible! Sunday was a very special day for several of our students as we had the Rite of Welcoming to those who are preparing for their Sacraments in April – 24 are preparing for Baptism and 11 are getting ready for First Communion. The Rite of Welcome designates the students as ‘catechumens’ or a person sounding things out. It is a way for the students to let others know they are serious about learning more about Jesus and how they can walk with Him while asking their fellow students to keep them in prayer that their efforts will be successful. We’ll have a Retreat for them and their families in February and they’ll receive their Sacraments on April 12 when we return from Easter Break. Even though it’s just December, we had the eighth grade graduation picture taken this past week. We have to plan ahead quite a ways to make sure things are ready to be mailed out when the time comes. Yesterday, I attended the funeral of one of our former employees, Lowell. He and his wife, Connie, served as houseparents at St. Joseph’s for many years. Lowell loved playing tricks, but could always be counted on for a hug when anyone needed one. All the students of St. Joseph’s were listed as honorary pall bearers – the children touched his heart so deeply. His wife continues to help here at St. Joseph’s in the health center, taking students to their appointments with doctors, dentists or optometrists and helps keep the medical records in order. We extend our sympathy to the family. May you continue to have a beautiful Advent Season and prepare the way of the Lord. We are grateful for your generosity and support. We’ll finish this month’s novena of Masses for you on December 19. Thank you all.. Looks like another fun filled week.. Enjoy.. Merry Christmas and God Bless!